Being from Ireland and living in Dublin, we count ourselves lucky to be able to frequently revisit amazing ancient sites throughout the whole year. We’ve seen every season in every part of the country and lately, we’ve found ourselves concluding that Autumn is our favourite time to get out and explore our ancient sites. In Autumn, it’s harvest time and we have two very important dates in the ancient Gaelic calendar - the Autumn Equinox and Samhain (Halloween). The celebrations around Autumn/Winter time were held in the highest regard because it was the ending of the old and beginning of a new year and the final harvest was gathered for the coming dark days of winter. Samhain was believed to be the night that the veil between this world and the next was at its thinnest, when the souls of the departed from the year gone by, walked among the living as they passed to the Other world. It’s still a time to honour and remember your loved ones that have died and to be thankful for the past year. With the changing colours of the foliage and the sun lower in the sky, it is remarkable how this season puts you in the mood for reflection. It’s easy to see how the ancient people of this land interpreted the solar cycle and the seasons, incorporating them into their understanding of life, death and rebirth. The knowledge of people from 5,000 years ago is revealed in the hill-top tombs, adorned with neolithic stone carvings, aligned with the rising and setting of a solstice or equinox sun, that still command a striking presence on the lush green landscape, all over Ireland. The ancient Irish were students of celestial movement and completed amazing feats of engineering, to capture sunlight and moonbeams inside stone chambers of varying sizes. Before the Pyramids were built, they were perfectly positioning the entrances of structures so that they directly linked to each other across hundreds of miles and ensured their sacred carvings were illuminated at specific moments in time each year. It was at these ancient sites that the druids performed sacred rituals and where the celebrations of Samhain (Halloween), Imbolc (first day of Spring), Beltaine (first day of Summer), Lughnasa (first day of Autumn or Harvest season) and the solstices in between, were held. Some of the most impressive and more well known sites are concentrated in the Boyne Valley in County Meath. It’s here you’ll find the famous complex of monuments built along a bend of the River Boyne, known collectively as Brú na Bóinne (Newgrange, Knowth and Dowth). Also located in the Boyne Valley are the lesser known, Loughcrew Cairns. We camped overnight there so we could witness the rising sun of the Autumn Equinox, shine its first light into the chamber of the Hag’s Cairn (Cairn T). It was our first time to join in an ancient Gaelic ceremony and it was a fascinating event. It gave us an appetite for exploring more of our ancient heritage and the drive to document our experiences. Our most recent trips included the Hill of Tara and the Hill of Tlachtga. It was a beautiful, sunny, Autumn afternoon when we decided to head for the Hill of Tara. We had been before, years ago, and felt it was time for a rediscovery, since we had learned so much about the area while visiting Newgrange and Loughcrew. 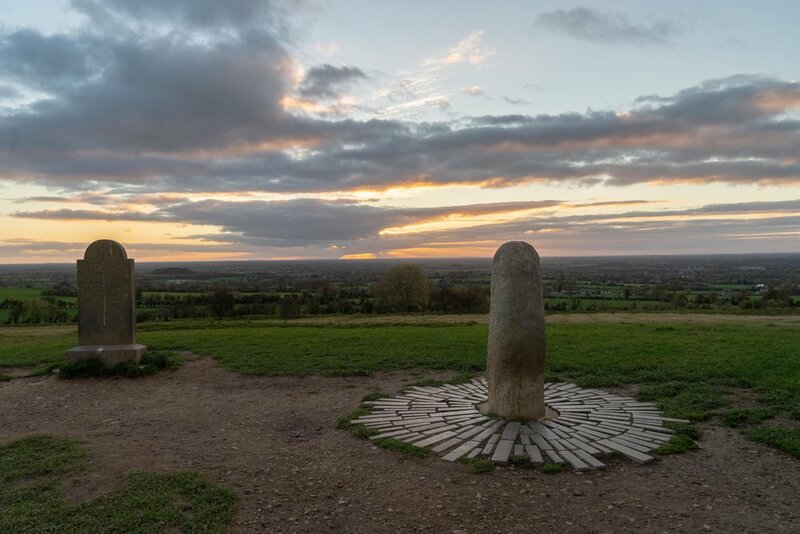 The Hill of Tara, standing high above the surrounding landscape, was revered as the entrance to the Other world and later became the seat for the High Kings of Ireland. The Stone of Destiny stands on top, which is considered to be a fertility symbol but legend has it that it roared, once it approved of a newly crowned King. The oldest monument, among many at Tara, is the Mound of Hostages. This is a passage tomb built 5,000 years ago, aligned with the rising sun of Samhain which is halfway between the Autumn Equinox and the Winter Solstice. The elevation of Tara, makes it possible to see Loughcrew (aligned with the sunrise at the Autumn Equinox) and Newgrange (aligned with the sunrise at the Winter Solstice), which serves to emphasise the importance of the connection between the tombs in the Boyne Valley. The views are simply stunning and we stayed for the sunset, which we highly recommend. The colours of the old trees in the woodland trail around the hill, created the perfect atmosphere for feeling the energy of this most sacred of Irish sites. 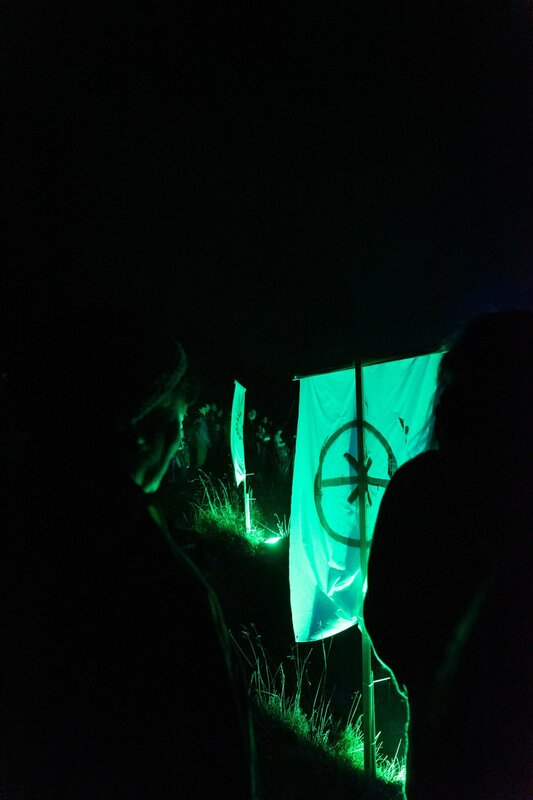 We were delighted that we could participate in the celebration of Samhain (meaning Summer’s end) with the Great Fire Festival on Tlachtga, the home of halloween. Located just outside Athboy, in County Meath, it is believed that the very first fire of Samhain was lit here over 3,000 years ago. The tradition of extinguishing all fires in the Kingdom before the celebration, in order to be rekindled by the sacred flame of Tlachtga, on the eve of Samhain, was maintained up until the arrival of Christianity to Ireland. Halloween is known throughout the world as a time of scary ghouls and ghosts and trick-or-treats but to the ancient Irish it was a sacred night and a great celebration of thanking the gods for a successful harvest and the animals that were sacrificed for the winter. Tlachtga was the epicentre for pre-Celtic worship and the great fire that was lit on this hill on every Samhain night was used to light all other fires throughout the land. Once the High King of Ireland, from his seat at the Hill of Tara twelve miles away, could see the sacred fire was lit, he knew all would be well in his kingdom for the coming year and held a great feast in the Fort of the Kings. Thanks to the hard work and efforts of Joe Conlon, ‘Keeper of the Hill’ and the Friends of Tlachtga, the celebration has been revived. After reading a little bit about it on Spirits of Meath, we decided to head there early, as we really didn’t know what to expect. We were greeted by some of the friendly locals and experts such as @MeaveofConnaugh who were working hard preparing for the event and they filled us in on the history of Tlachtga and how the celebration was organised. We were going to join the procession that starts from the town of Athboy but we got talking to so many lovely people the time went by too fast on us! We were so lucky we stayed though because the sunset was just unbelievable. It was so fitting that it was the last sunset of the summer and it set the atmosphere for the night. When the light finally faded we could hear the drums from the procession coming up the hill and the stars began to appear above us. As the druids and participants arrived and gathered in a circle, the mists moved in to signify the souls of the departed joining us for the event. It was a tremendous evening of song and story and the great wheel that was set ablaze for the closing ceremony recreated the magic and mystery reminiscent of the ancient spiritual rites of our heritage. It’s a great event for all the family to enjoy and it’s all completely free. It’s definitely something to consider when planning your next Halloween night. If you’re planning a trip to Ireland we highly recommend visiting in the off season. Travelling to Ireland in the off season is cheaper, as is accommodation. There are less crowds but you’ll still find a lovely welcome and great atmosphere everywhere you go. Find out why Ireland’s northwest is best for off season travel or walk among the spring wildflowers in Burren National Park.